To get the most out of the FSI Pages Converter when using external CSV data, the CSV data sheet should contain all relevant information you want to add to the catalog. Link: The Link field contains the Article-IDs the hyperlinks in the PDF document point to. This is the colum FSI Pages Converter uses to merge the data from the external CSV file with the Images created from the PDF. Headline: The headline description we will use at the top of the tooltip in FSI Pages. Text: Contains the long descriptive text of the items in our imaginary catalog. Search: This column contains additional search patterns we want the items to be found, when searched for. In this example we consider the upper 2 items being gold and the other 2 items being silver. Once FSI Pages Converter is loaded, select the PDF file and set an output path, then take a look at the “Links” section in the preferences tab. Enable “Include Links” here and uncheck everything else. Besides the Links we get all other information in the “External Data” preferences tab. In named tab, chose the CSV data file you want to use. Once FSI Pages Converter loaded the file, it will list all header names in the “Text fields” list. For our sample we retrieve the list shown in the figure below. First off we start with the tooltip display that will show up in FSI Pages when the user hovers the mouse over a hyperlink. Select “Headline” in the “Text Fields” list and click the “Add”-button or DoubleClick on “Headline”. The “Text Template” text area now contains the text ‘[Headline]’, which is the placeholder. It will be replaced by the content in the “Headline” data column for the particular article. FSI Pages Converter displays the first Headline it finds in the CSV Data next to the “Text Template” area. Next we place the cursor in a new line and add the “Text”-Textfield to the “Text Template”, mark its placeholder and make it italic. Note how the entire text in the preview window switches to italic. Note: When using numbers in Excel sheets, please make sure the column is formatted as text. 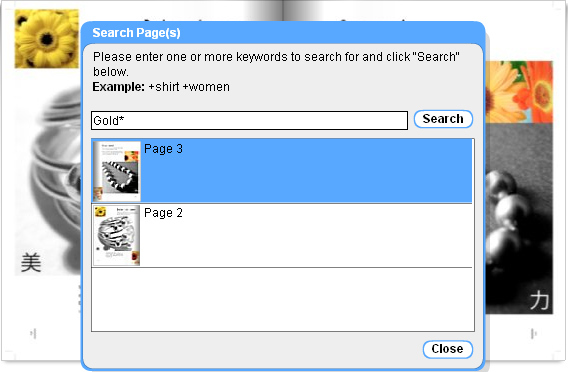 In the “Search” section here, set the Method to “Page Index”. Our CSV data sheet holds the search pattern we want each page to be found, when searched for, as well as the page number in the “Page” colum, so we set the “Page Index field” to “Page”. In “Search fields” we choose ‘Search’, ‘Text’ and ‘Headline’. That way, all 3 fields will get searched in, and upon hit, the page will be found. By including the “Search” column here, you can add additional search terms to your articles, that do not appear in the description. To enable the search, check the “Enable Searching” option, found under “More Options” when publishing your catalog. If you search the catalog for “gold” or “silver” the search results will bring up the articles as set in the CSV data, even though the search term “gold” or “silver” does not appear anywhere in the tooltip texts, while the other selected Search Fields still work as usual.